Prior to interning with Cobb County, Joshua Shapiro, a GIS student at Kennesaw State University, was not familiar with county government operations. 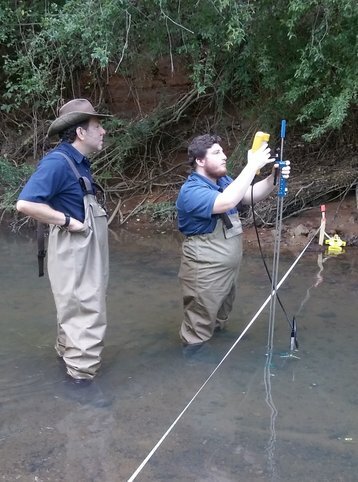 Through his GIS internship in the Department of Stream Monitoring, Shapiro learned that the county is responsible for a wide variety of responsibilities from testing stream water to providing services to senior citizens. During the course of his internship, Shapiro’s responsibilities focused on GIS mapping and related tasks, including field work. He was tasked with creating maps showing sampling sites that were incorporated into a departmental report. He also created maps that will assist in the day-to-day activities of his supervisors to better visualize their data. These included a master map showing chemical, bug, and fish data and a watershed map showing the watersheds of each site. Shapiro believes his most significant success was his watershed map, which took him weeks to complete. Although several issues arose during this project, he was able to resolve those problems with the assistance of his supervisors. Shapiro’s favorite part of the internship experience included fish sampling and field work, which he believes taught him the most during his internship. Seeing the whole process from collection to testing gave him additional insight into the work the lab performs. This position not only gave him a way to apply his existing skills, but also to improve them. To future interns, Shapiro said it is a great place to work and the coworkers are great people who are always willing to help. The main piece of advice he has revolves around effective time management. When asked if he has a future in county government, Shapiro answered yes. For more information on the GCIP, please visit the ACCG Civic Affairs Foundation website at http://www.civicaffairs.org.